Looking back on 2017 and the things I wanted to focus on, it reminds me on how fast time goes. One thing I definitely want to do in the New Year is be more intentional- with my words, my actions and my time. Find a better way to react in the heat of the moment. Plan more get together's with friends and venture out to connect with more women. Fall back in love with my body. Live for today and organize for the future. Overall, I would say I did good. I'm still not the best at reacting to things in the heat of the moment. Sometimes the best thing for me to do to calm down and think about things is to walk away, and I'm not great at that. Get together's didn't happen much- damn you pregnancy. I spent a good 4 months sick in bed when I wasn't working- so there's that. I don't like to pat myself on the back but I would say I encouraged and inspired based on the comments and e-mails I receive from blogging. My goal is to inspire someone daily, so I hope that continues. Thanks to the sickness from pregnancy I lost a lot of weight that jumpstarted me to losing a bit more and falling back in love with my body. I'm not 100% there, but I'm excited to stay on top of things and incorporate exercising in to my life more. After Chuck's stroke in 2016 we vowed to live more in the moment, and I would say I did that. Taking advantage of being alive and well and enjoying each day is so important! I've gotten rid of some clutter, organized portions of my life much better, and feel a lot better waking up each day. 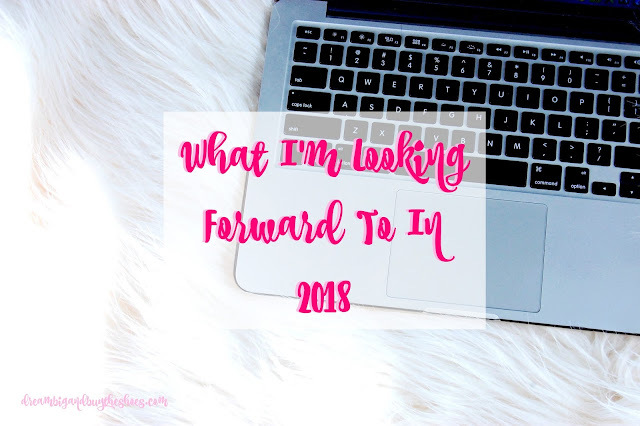 This year I am looking forward to learning more- whether that is with photography, or another hobby that is an extension from blogging I love to learn. I am looking forward to special times with my family, and enjoying a whole new stage of life and being a mom to Bella. I want to travel to new places and explore more parts of Erie that we haven't enjoyed yet. A new year full of whole new possibilities excites me so much! I hope you all have a wonderful start to the New Year and a happy 2018 full of good health, adventure and all your dreams becoming a reality! What are you looking forward to in 2018?